Exclusive Offer – only in April 2019, act now! : Get the most popular “PM PrepCast for CAPM ELITE” – the “PM PrepCast for CAPM”PLUS the “CAPM Exam Simulator” at a discounted price! This bundle here is probably the best combination of prep material you can get to assure your exam success within a short time! Do not hesitate to secure your package now at this special price! Act now! Offer has started! Act now! Register with bonus code - Apr19 - and get 10% Discount! 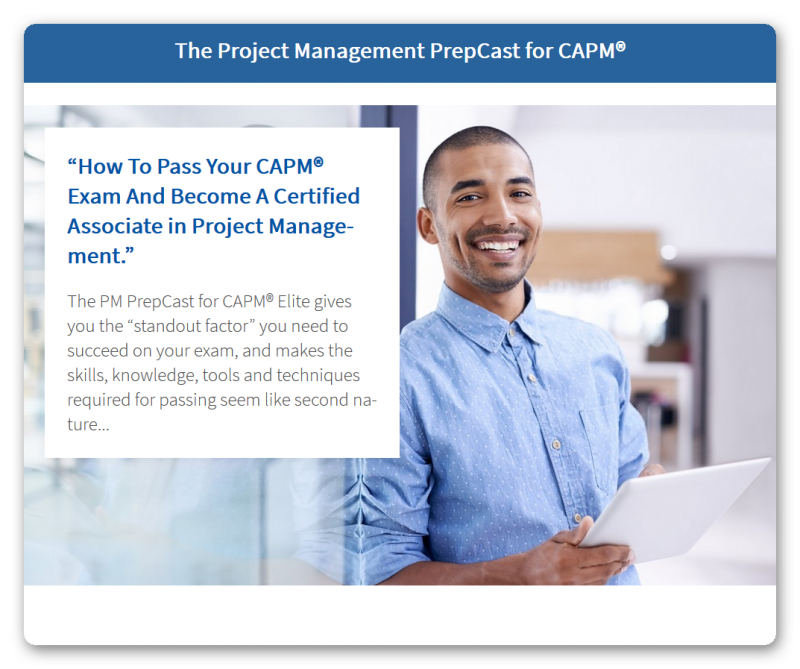 With the PrepCast for CAPM Elite you do not only get the course but in addition, you will get the probably best CAPM Exam simulator out there! No clue HOW and WHERE to start? That free Ebook will show you! Click here to get your Ebook immediately and kick start your PMP preparation! For instance you will learn which study materials you "must have" and which are optional. Do you want a MP4PM Sneak Preview? MP4PM Project Charter Package - FREE Download! If you are interested in a pre-taste of MP4PM you can now download my FREE MP4PM Project Charter Package! Click on the Button below to get your Free Package immediately and kick start your next Project with that Project Charter Package! You will get several deliverables which you can use out of the box even if you never have done MindMapping before or even do not use a Mind Mapping Software currently. Clicl on the Button to get an overview of what you will receive with this package. I am 100% confident that you will like it.